Received February 27, 2019; Revised March 7, 2019; Accepted March 7, 2019. Acute limb ischemia (ALI) represents one of the most common emergent scenarios encountered by a vascular specialist. Despite expedient revascularization, high rates of limb loss are reported along with high mortality rates which are second only to ruptured abdominal aortic aneurysms. Surgical revascularization is standard of care. Endovascular techniques as an alternative have emerged to be appropriate first line therapy when addressing the threatened limb. We review the etiology and classification of ALI and current endovascular techniques and evidence to date in the management of patients acutely presenting with extremity ischemia. Acute limb ischemia (ALI) resulting from sudden loss of arterial perfusion to the affected extremity is a common, but devastating condition encountered by vascular surgeons and interventionalists. Studies have shown an incidence as high as 22–26 per 100,000 patients per year . Rapid evaluation is paramount and selection of an appropriate treatment strategy for revascularization is essential in determining successful clinical outcome in both limb salvage and reduction of patient morbidity and mortality. Surgical revascularization has long been the standard approach to restoration of limb perfusion, however with advancements in thrombolytic therapy and catheter based techniques, endovascular approaches have emerged as first line therapy in the treatment of ALI [2–7]. Despite vast therapeutic modalities available in the current era, ALI continues to challenge the vascular specialist, as the clinical gravity of presenting patients result in major amputation rates of 15% to 50% [1,2,4–6,8–10]. The risk of mortality remains high due to inherent comorbidities in ALI patients and approximately 15% to 20% die within the 1st year after presenting with the ALI event [1–3,5,6,9,11]. ALI is generally defined when symptom onset is within two weeks prior to the patient presentation. The well-known mnemonic ‘the six Ps’ summarizes key features of the condition: pain, pallor, pulselessness, paresthesia, poikilothermia, and paralysis. Clinical presentation and degree of clinical acuity is a wide spectrum ranging from new claudication and rest pain to sudden paralysis. Sudden changes in symptoms are key to appropriate triage and neuro deficits generally drive the timing of revascularization. Patients are commonly classified according to the Rutherford ALI classification system . Rutherford class I ALI represents patients with viable limbs and preserved arterial signals. Patients typically have no neuromotor or sensory deficits and may not all require revascularization. Rutherford class II ALI denotes threatened limbs, and all cases require revascularization for limb salvage. Differentiation of class IIa from IIb ALI determine the rapidity to which limb perfusion must be restored. In class IIa ALI, patients demonstrate mild sensory deficits but no motor deficits. In IIb ALI, the onset of neuromotor dysfunction determines this classification status. Much of the debate regarding decisions for initial revascularization modality (conventional open surgery vs. catheter based interventions) revolve around this group of ALI patients. Class III ALI refers to patients with irreversible ischemia where limbs are insensate, paralyzed, rigid, and have no arterial or venous signals. Restoration of perfusion in class III ischemia may risk the patient to negative systemic effects of ischemic-reperfusion injury, such as renal and cardiac dysfunction at the low chance of salvaging a functional limb [1,6]. Most vascular surgeons concur, primary amputation may the optimal treatment for Class III ischemia. Vascular pathology leading to ALI can be highly variable and understanding the clinical etiology behind the event is critical in revascularization decision making and subsequent outcomes. ALI etiologies can generally be categorized into in-situ arterial thrombosis, embolus, or aneurysm (which can present with both thrombosis or lead to distal embolism). Patients may present with mutual symptoms of ischemia in any of the above conditions, however each disease pathway requires different treatment strategies for optimal outcome. The most common etiologies of embolism include cardiogenic or a diseased artery proximal to the affected arterial bed (i.e., unstable atherosclerotic plaque or aneurysm). Cardiac arrhythmias or dysfunction, most frequently atrial fibrillation, myocardial infarction, or cardiac valve issues represent up to 80% of arterial embolism . In-situ thrombosis commonly occur within diseased native artery (ruptured atherosclerotic plaque, aneurysm, arterial dissections), prior surgical bypass grafts or vascular prosthesis, and trauma. Arterial aneurysms, most frequently popliteal, can rapidly become an emergent limb and life-threatening condition with high morbidity and mortality [1,12]. Aneurysms can present with both severe distal embolism affecting outflow arterial beds along with thrombosis of the aneurysmal segment. Revascularization must address both processes along with exclusion of the aneurysm itself. After initiation of therapeutic anticoagulation, traditionally, urgent surgical intervention entailing thromboembolectomy, placement of a bypass graft, or other techniques to restore arterial flow to the extremity. Open surgical techniques have been preferred because time to reperfusion is rapid especially when faced with class IIb ALI. Early operative intervention, however, result in considerable risk of perioperative mortality. Despite advances in resuscitative care, reports state mortality rates as high as 20% in patients undergoing operative revascularization for ALI [1,6,8,13]. Individuals who present with ALI comprise one of the sickest subgroups of patients that the vascular specialist is asked to treat. Physiologically compromised state of ALI in addition to inherent comorbidities that precipitated the thrombotic event drive mortality. Subjecting these individuals to invasive surgical procedures without adequate preoperative stabilization and preparation in combination with general anesthesia result in high rate of perioperative cardiopulmonary complications often encountered [1,8,11,13]. Furthermore, traditional Fogarty balloon assisted thrombectomy may be incomplete in restoring limb perfusion and emergency lower extremity bypass for ALI has been shown to be associated with increased rates of serious in-hospital adverse events, major amputation rates and mortality . In that regard, percutaneous techniques in ALI offer a safe and potentially less invasive alternative to open surgical revascularization. Advantages of endovascular therapies are many in addition to being a less invasive option in the acutely frail patient. Suboptimal revascularization is not to uncommon with surgical strategies for ALI. Residual thrombus has been demonstrated in a large fraction of vessels after open surgical thrombectomies [2,8,14]. Thrombolytics which are cornerstone to endovascular modalities in ALI management, often help to identify causative lesions that precipitated the event. The culprit lesion can then be treated using endovascular or open surgical techniques to provide durable long-term solutions (Fig. 1). Additionally, lytic therapy is often superior in restoring patency of outflow vessels often difficult to address with conventional open techniques [1,11,13,15]. In recent years, mechanical endovascular solutions have evolved for more rapid clearance of thrombus and emboli in severe ischemia that require expedient revascularization [15–18]. Emerging devices and new data support the value of endovascular treatment as a first-line approach to ALI and perhaps as a preferred modality over traditional open surgical strategies. In catheter directed thrombolysis (CDT), thrombolytic medication (tissue plasminogen activator, t-PA) is infused over time that span hours to days, in the region of thrombus using a multi side-hole catheter . Either retrograde ‘up and over’ or antegrade, and at times combination antegrade and retrograde infusion systems are employed for infusion after crossing the occluded segment. Currently in the United States recombinant t-PA (Alteplase Genentech, Inc., San Francisco, CA, USA) is the agent of choice for CDT. Infusion rates ranging from 0.5 to 1 mg/h are used along with concurrent infusion of 200–500 units of heparin through the side port of the vascular sheath to prevent access vessel thrombosis during treatment. Repeat angiograms are performed periodically (typically 24 hour intervals at our institution) to assess therapy progress. Elements of clinical history are important in determining relative and absolute contraindications of thrombolytic therapy for appropriate risk stratification for bleeding events. Physicians must inquire about recent trauma or major surgery, recent cardiopulmonary resuscitation, cranial or spinal surgery, active malignancy, intracranial tumor burden and aneurysms, stroke, recent vascular interventions, known active bleeding conditions, severe and uncontrolled hypertension, and lastly pregnancy. Severe, underlying renal disease may also preclude CDT and other image based percutaneous modalities given contrast requirements. In the mid-1990s, three landmark randomized trials addressed the validity of CDT [2–5]. In the Rochester study, Ouriel and colleagues randomized 114 patients with ALI of less than 7 days’ duration to thrombolysis with urokinase or open surgery. Equivalent 1-year limb salvage rates were seen at 80% for both modalities but a better event-free survival rate at 1-year was noted in the CDT group than in the open surgery group (75% vs. 52%; P=0.020) . More importantly, in that trial, thrombolysis was associated with a significant reduction in mortality (84% 1-year survival in CDT vs. 58% open revascularization, P<0.01) . The surgical revascularization versus thrombolysis for nonembolic lower extremity native artery occlusions (STILE) trial randomized 393 patients with non-embolic lower extremity ischemia with a broad time inclusion of less than 6 months’ duration. Many of the enrolled patient in the trial presented with chronic ischemia. Subsequently, patients randomized to CDT had higher rate of treatment failure at 30 days compared to surgery, leading to premature termination of the study. Results of a later subgroup analysis, however, favored CDT in STILE study population. Cohort presenting with true ALI (<14 days duration) and randomized to CDT had significantly better limb salvage compared to surgery (89% vs. 70%, P<0.020) and again saw longitudinal mortality benefit (7% CDT vs. 32% surgery at 1-year) . The Thrombolysis or Peripheral Arterial Surgery (TOPAS) clinical trial randomized 544 patients with acute lower extremity ischemia secondary to native arterial or bypass graft occlusion of less than 14 days’ duration. Overall mortality and amputation-free survival rates at 1-year were similar, but ALI randomized to lysis demonstrated a trend toward a lower major amputation rate at 30 days (P=0.074) and significantly at 1 year (P=0.026) compared with surgical patients . TOPAS showed that CDT was highly effective for graft thrombosis with patency restored by lysis in 84% of cases and 42% had a major reduction in their planned operation for graft revision . There was, however, significantly more bleeding complications in the CDT group. A recent Cochrane database meta-analysis of the studies concluded that there was no overall difference in limb salvage, death or amputation-free survival at 30 days or 1 year. On the other hand, CDT appeared to be associated with higher rates of stroke at 30 days (1.3%) compared with none in the surgical cohort (odds ratio [OR], 6.41; 95% confidence interval [CI], 1.57–26.22) . Thrombolysis patients displayed an equivalent overall survival rate compared with surgery (OR, 0.87; 95% CI, 0.61–1.25) . The authors concluded that initial treatment with either surgery or thrombolysis cannot be advocated on the basis of the available evidence. A limitation of the Cochrane meta-analysis was the low precision of the estimates. In another more inclusive meta-analysis by Enezate et al. , demonstrated benefit trends in mortality and limb salvage favoring percutaneous interventions. In that study, 30-day survival for CDT versus surgery was trended better with an OR of 0.70 (95% CI, 0.33–1.50), and at 1 year (OR, 0.74; 95% CI, 0.29–1.85) . Similar trends were seen in amputation rates between CDT versus surgical revascularization at 1 month (OR, 0.75; 95% CI, 0.40–1.42) and at 1 year (OR, 0.81; 95% CI, 0.55–1.18) . Pharmacomechanical thrombectomy (PMT) devices are utilized stand alone or more commonly in adjunct with CDT with the goal of endovascular thrombus maceration and removal. PMT devices in general can be categorized as rheolytic, rotational, or ultrasound enhanced. Along with the introduction of aspiration, PMT devices enhance the surgeon’s ability to remove thrombus quickly, resulting in lower doses of thrombolytic drugs and reducing the time to reperfusion. There are over 20 devices employed and available for this purpose. A list common commercially available devices and their primary mechanism of action is listed in Table 1. Our institution most commonly uses the AngioJet (Boston Scientific, Quincy, MA, USA) rheolytic device which allows pulsed spray delivery of t-PA or saline locally while aspirating thrombus. Leung et al. reported the clinical effectiveness of the Angiojet in the PEARL registry (Rheolytic PMT for the Management of ALI). The limb salvage and overall survival rates were 81% and 91%, respectively, at 12 months. There were significantly better outcomes in patients without infrapopliteal disease and in those who underwent PMT without needing CDT. In addition to the 52% that did not require adjunct CDT, there were higher rates of technical success (88% vs. 74%; P=0.021), 12-month amputation-free survival (87% vs. 72%; P=0.028), and 12-month freedom from amputation (96% vs. 81%; P=0.010) in the PMT without CDT group . Various other devices designed for venous thrombosis are being tried for mechanical thrombectomy in ALI, such as the Inari FlowTriever and ClotTriever devices (Inari Medical, Aliso Viejo, CA, USA), but practical applications in the peripheral arteries are limited. Promising results of PMT, nevertheless, appear to demonstrate comparability to surgical techniques. However, more studies are necessary to effectively compare PMT with surgical techniques to establish best clinical guidelines in management of class IIb ALI. Vacuum assisted percutaneous aspiration thrombectomy (PAT) with the Penumbra Indigo Mechanical Thrombectomy System (Penumbra, Alameda, CA, USA) is emerging as an effective tool to remove thrombi and emboli from arteries and veins. Our institution commonly employs the Indigo catheter which is an improvement over previous generation endovascular thrombectomy devices that had limitations including trackability, tendency for vessel trauma, and incomplete revascularization. The Indigo system was first launched in 2008 for clot retrieval in cases of ischemic stroke. A PAT system specifically tailored to peripheral arterial revascularization was launched in 2014. The Indigo PAT has three components: vacuum pump, catheter, and clot separator/agitator. The pump generation a continuous vacuum aspiration of 29 mmHg through a non-collapsing catheter which are designed with a tapered atraumatic tip for vessel navigation and clot engagement. The separator is a specially designed wire with a tear drop shaped tip that is inserted through the Indigo catheter and moved back and forth in order to agitate and mobilize thrombus while simultaneously clearing the catheter lumen of clot. In the multicenter PRISM study assessing the Indigo system (Utility of a Power Aspiration-Based Extraction Technique as an Initial and Secondary Approach in the Treatment of Peripheral Arterial Thromboembolism: Results of the Multicenter PRISM Trial XTRACT study), complete or near-complete revascularization was achieved in 87.2% of patients immediately after the XTRACT procedure and before any other intervention . Successful revascularization was achieved in 79.5% of patients as an initial treatment and in 92.5% as salvage or secondary therapy after failed CDT  Complete thrombus removal and restoration of normal flow was achieved in 77.2% of patients after all endovascular treatment was completed. No patients required surgical revascularization. The authors concluded that PAT with the Indigo system in acute or subacute peripheral arterial occlusions was safe an effective. ALI is a challenging clinical entity placing patients at risk of both life and limb. Surgery has long been the paradigm for expedient revascularization ALI. Modern experience, however, has shown endovascular strategies to be safe and effective with success rates comparable to surgical experience. Review of current data suggests reduction in perioperative morbidity and mortality with endovascular treatment of ALI. Based on available evidence and experience, an endovascular first approach to ALI is appropriate. Regardless, ideal treatment selection is case dependent and depends on the astute vascular specialist who can also incorporate surgical strategies for optimal outcomes. A comprehensive understanding of the ALI event, its etiology and pathophysiology in addition to a thorough understanding of the limitations and advantages of available endovascular devices and associated pharmacology is essential to the successful management of patient with ALI. Fig. 1. 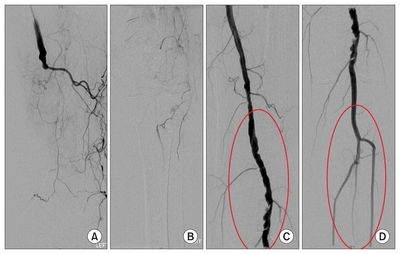 Angiographic images of a patient presenting with left lower extremity acute limb ischemia. An acute occlusion at the level of the left adductor canal superficial femoral artery is (A) visualized with (B) absent infrapopliteal runoff vessels. (C) Following successful catheter directed thrombolysis, a causative, irregular atherosclerotic lesion is identified. (D) Furthermore, restoration of preserved outflow tibial vessels is demonstrated following thrombolysis. PMT, percutaneous mechanical thrombectomy; PAT, percutaneous aspiration thrombectomy. *Not currently available in USA. Creager MA, Kaufman JA, Conte MS. Clinical practice. Acute limb ischemia. N Engl J Med 2012;366:2198-2206. Ouriel K, Shortell CK, DeWeese JA, Green RM, Francis CW, Azodo MV, et al. A comparison of thrombolytic therapy with operative revascularization in the initial treatment of acute peripheral arterial ischemia. J Vasc Surg 1994;19:1021-1030. Comerota AJ, Weaver FA, Hosking JD, Froehlich J, Folander H, Sussman B, et al. Results of a prospective, randomized trial of surgery versus thrombolysis for occluded lower extremity bypass grafts. Am J Surg 1996;172:105-112. Ouriel K, Veith FJ, Sasahara AA. Thrombolysis or peripheral arterial surgery: phase I results. TOPAS Investigators. J Vasc Surg 1996;23:64-73 discussion 74–75..
Weaver FA, Comerota AJ, Youngblood M, Froehlich J, Hosking JD, Papanicolaou G. Surgical revascularization versus thrombolysis for nonembolic lower extremity native artery occlusions: results of a prospective randomized trial. The STILE Investigators. Surgery versus thrombolysis for ischemia of the lower extremity. J Vasc Surg 1996;24:513-521 discussion 521–523..
Rutherford RB. Clinical staging of acute limb ischemia as the basis for choice of revascularization method: when and how to intervene. Semin Vasc Surg 2009;22:5-9. Ueda T, Murata S, Miki I, Yasui D, Sugihara F, Tajima H, et al. Endovascular treatment strategy using catheter-directed thrombolysis, percutaneous aspiration thromboembolectomy, and angioplasty for acute upper limb ischemia. Cardiovasc Intervent Radiol 2017;40:978-986. Baril DT, Patel VI, Judelson DR, Goodney PP, McPhee JT, Hevelone ND, et al. Outcomes of lower extremity bypass performed for acute limb ischemia. J Vasc Surg 2013;58:949-956. Enezate TH, Omran J, Mahmud E, Patel M, Abu-Fadel MS, White CJ, et al. Endovascular versus surgical treatment for acute limb ischemia: a systematic review and meta-analysis of clinical trials. Cardiovasc Diagn Ther 2017;7:264-271.
de Athayde Soares R, Matielo MF, Brochado Neto FC, Cury MVM, Duque de Almeida R, de Jesus Martins M, et al. Analysis of the results of endovascular and open surgical treatment of acute limb ischemia. J Vasc Surg 2019;69:843-849. Ouriel K. Endovascular techniques in the treatment of acute limb ischemia: thrombolytic agents, trials, and percutaneous mechanical thrombectomy techniques. Semin Vasc Surg 2003;16:270-279. Theodoridis PG, Davos CH, Dodos I, Iatrou N, Potouridis A, Pappas GM, et al. Thrombolysis in acute lower limb ischemia: review of the current literature. Ann Vasc Surg 2018;52:255-262. Obara H, Matsubara K, Kitagawa Y. Acute limb ischemia. Ann Vasc Dis 2018;11:443-448. Plecha FR, Pories WJ. Intraoperative angiography in the immediate assessment of arterial reconstruction. Arch Surg 1972;105:902-907. Davis FM, Albright J, Gallagher KA, Gurm HS, Koenig GC, Schreiber T, et al. Early outcomes following endovascular, open surgical, and hybrid revascularization for lower extremity acute limb ischemia. Ann Vasc Surg 2018;51:106-112. Kwok CHR, Fleming S, Chan KKC, Tibballs J, Samuelson S, Ferguson J, et al. Aspiration thrombectomy versus conventional catheter-directed thrombolysis as first-line treatment for noniatrogenic acute lower limb ischemia. J Vasc Interv Radiol 2018;29:607-613. Saxon RR, Benenati JF, Teigen C, Adams GL, Sewall LE, PRISM Trialists. Utility of a power aspiration-based extraction technique as an initial and secondary approach in the treatment of peripheral arterial thromboembolism: results of the multicenter PRISM trial. J Vasc Interv Radiol 2018;29:92-100. Vorwerk D, Triebe S, Ziegler S, Ruppert V. Percutaneous mechanical thromboembolectomy in acute lower limb ischemia. Cardiovasc Intervent Radiol 2019;42:178-185. Darwood R, Berridge DC, Kessel DO, Robertson I, Forster R. Surgery versus thrombolysis for the initial management of acute limb ischaemia. Cochrane Database Syst Rev 2018(8):CD002784. Leung DA, Blitz LR, Nelson T, Amin A, Soukas PA, Nanjundappa A, et al. Rheolytic pharmacomechanical thrombectomy for the management of acute limb ischemia: results from the PEARL registry. J Endovasc Ther 2015;22:546-557.